All ceramic restorations contain no metal substructure and, as such, are able to absorb and transmit the shade of the adjacent teeth and the tooth structure beneath the restoration. As a result, these restorations have a chameleon effect which blends them very nicely with the surrounding dentition. Many years ago, all ceramic restorations were considered by most to be weaker than similar restorations containing a metal substructure. Through advances in both materials and technology, all ceramic restorations, depending upon the application, are equally as strong as the porcelain fused to metal restorations they once could not replace. Anterior or posterior, single unit or bridge, sufficient or minimal occlusal clearance, we have the all ceramic product to fit your needs. Made by Ivoclar Vivadent, IPS e.max for crowns, bridges, onlays, inlays, and veneers is a lithium disilicate glass ceramic that has optimized translucency, durability, and strength. Due to the use of new technologies and optimized processing parameters, IPS e.max lithium disilicate has evolved beyond previously available lithium disilicate ceramics. IPS e.max restorations exhibit superior durability featuring an average flexural strength of 500 MPa. The opalescence, translucency, and light diffusion properties of IPS e.max lithium disilicate were all designed to replicate natural tooth structure for beauty and undetectable restorations. Click to view the full guide from Ivoclar. When strength and the best esthetics are indicated for a ceramic restoration, our zirconia copings stacked with e.max Ceram deliver. Depending upon the instructed shade and preparation, we will choose either a white or translucent blank, which will be shaded prior to sintering. The translucent cores are milled from the same material used to fabricate our full contour zirconia restorations. The zirconia cores can accommodate any margin preparation. When stacked with e.max Ceram, our zirconia-based restorations can accommodate single units and bridges up to 16 units in span. It is, however, more ideal to segment the bridge into multiple bridges whenever possible. You can cement your zirconia based all ceramic cases using a glass ionomer, resin-reinforced glass ionomer, or, for short or overly tapered preps, resin cement such as RelyX Unicem or Kuraray. 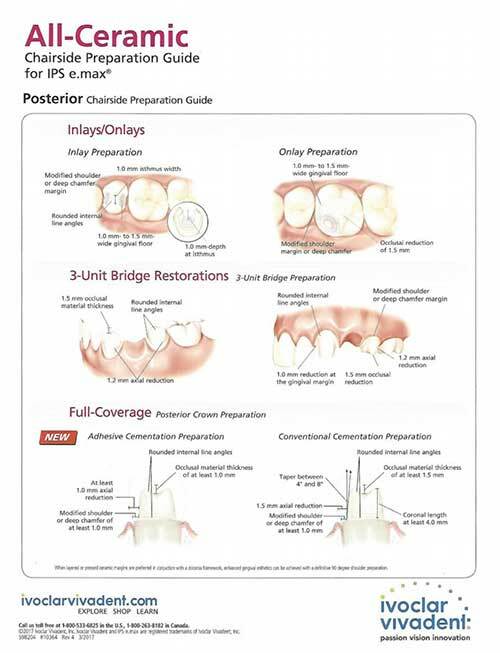 When a full-cast restoration or metal occlusion is ideal but not desired or the patient has fractured prior PFM crowns, prescribe a zirconia crown or 3-unit bridge, milled to full contour using CAD/CAM technology. Requiring a minimum occlusal clearance of 0.6mm and indicated for any margin preparation, it is the solution of choice when the patient does not want metal to show. Although the minimal clearance required is 0.6mm, a preparation with 1mm occlusal clearance is ideal. Our full-contour zirconia restorations are fabricated using an enhanced translucent material, which is highly esthetic. For anterior or posterior, they are indicated for single units and bridges up to 5 units (with pontic spans not more than 20mm). The strength-determining material in the full contour zirconia is yttrium oxide, and our zirconia material has a more even distribution of the yttrium oxide. That, coupled with the fine grain, results in stronger restorations with enhanced bending strength and unsurpassed fit. The chemical makeup is ZrO2 95%, Y2O3 4.5%, HfO2 <3%, with a flexural strength of 1100MPa and Vicker’s hardness of 1300. 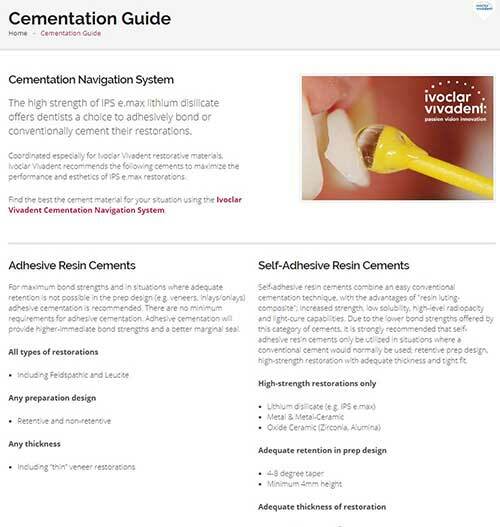 You can cement your full-contour zirconia cases using a glass ionomer, resin-reinforced glass ionomer, or, for short or overly tapered preps, resin cement such as RelyX Unicem or Kuraray. Adjustments can be made to the full-contour zirconia crowns and bridges using a fine-grit diamond with light pressure to avoid possible microfractures. A football-shaped bur is best for adjusting the occlusal surfaces of posterior units and the lingual surface of anterior units. Use a tapered bur for adjusting interproximal contacts and a round bur for adjusting a cusp or fossa.